As winter begins to take hold, Bergamo -- or, to be more precise, the Bergamo province -- comes into its own as a destination for skiing enthusiasts. Part of Bergamo’s attraction for skiers, especially those travelling from other countries, is that the airport at Orio al Serio (Milan Bergamo) is barely an hour to an hour and a half from the ski resorts close to the two major valleys of the province -- the Valle Brembana and the Valle Seriana. Both areas are well served by road, which makes the resorts easily accessible by bus or car. For the Brembana resorts, follow the SS470 route north-west from Bergamo, passing through the spa town of San Pellegrino. The SP2 route from Piazza Brembana eventually reaches Foppolo, which combines with nearby San Simone and Carona to make up the Brembo ski area. Foppolo has 120km of runs and a new section of piste on Monte Valgussera. Other roads from Piazza Brembana reach the resorts of Piazzatorre and Valtorta. The whole Brembana area offers more than 40 ski lifts and excellent opportunities for cross-country skiing amid fantastic scenery, especially around Conca dell’Alben, Oltre il Colle, Valtorta Piani di Bobbio, Branzi Gardata, Rocobello and Monte Avaro. Families and beginners, meanwhile, could head along the SS671, which follows the Valle Seriana, as far as the area around Castione della Presolana, where gentler slopes provide a ski training ground for the less experienced. Cross-country trails are plentiful around the valley, particularly at La Spessa, Clusone, Montagnina, Onore and Bondione. The more adventurous might try Monte Pora, Colere or Lizzola. 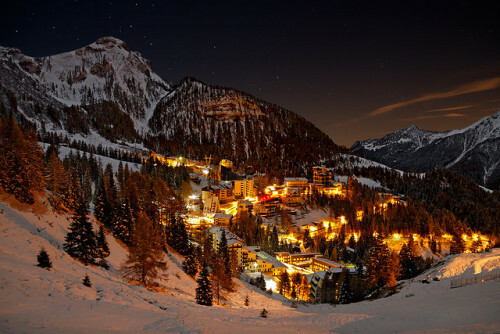 Christmas and New Year are seen as peak season, with the slopes quieter during the colder January weeks. The perfect time is often February on the lower slopes, with a good chances of sun as well as snow, with March the best month for the higher resorts, with the snow still good and longer, sunny days.